Observatory Atlas of the Moon. -- [Sacramento? ]: Published by the gift of W.W. Law, 1896-1897. In 1897, E.S. Holden, the Director of the Lick Observatory, began issuing in serial form the plates of a projected photographic lunar atlas. 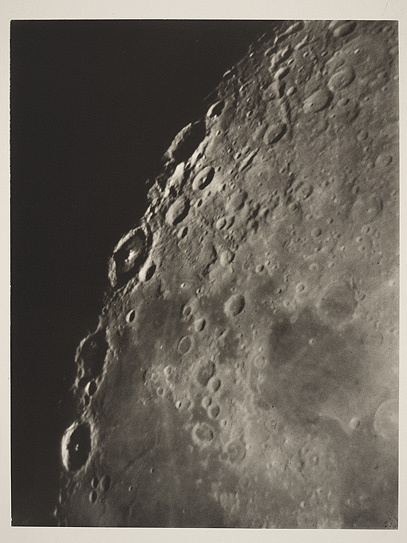 The plates were printed in photogravure, and the scale was a little over 3 feet to the moon's diameter, the same as the Mädler map. There was no particular arrangement to the plates, and after the nineteenth was issued, production ceased--perhaps because the plates were inferior to those of the Paris atlas, or because Ladislaus Weinek of Prague was in the process of issuing another atlas based on other Lick negatives.